One of the hard things about writing, aside from all of it, is keeping focused on the current project. When the words (and ideas) are flowing, it’s fairly easy to keep on task. After all, the story wants to be told, so it seems natural to tell it. Until you hit a block–either a lost desire to write or a tricky scene or you’re unclear where to go next. That’s when temptation strikes. It might be to not write at all. After all, you have two seasons of Voltron: Legendary Defenders to catch up on (and so much knitting to do). Or you’ll suddenly get an idea for another story. And since that’s new and exciting, you are raring to go write that one! Trust me, your brain/muse/shoulder-devil says, this story is much more interesting. This is where focusing comes in. Because as tempting as that shiny new story is, if you run off with it, you’ll be leaving the other story behind, likely to never get finished. Sometimes this might be a good thing–maybe you really aren’t feeling the story and it’s not something you want to finish. That’s a decision that needs to be made. But if you want to finish the story, then wandering off with the newest floozy story won’t help. I speak from experience. See, I have my current contemporary romance all plotted out (sorta) and I know where it needs to go. And I sorta knew how to get there. But there were a few scenes that were about to happen that were….not going to be incredibly exciting. And I didn’t want to write them, because I didn’t have the heaviest drama pulling me along, and I can’t have the guys arguing in every scene. Then, while working one day, I got this idea for a steampunk story inspired by The Glass Menagerie. At first I threw the idea on Twitter, because I totally wasn’t writing that story. And then spent the rest of the day thinking about it, plotting it out, checking the original plot of The Glass Menagerie and now I have a fully fleshed-out plot. The important part of this post, though, is that while I took notes, I didn’t start actually writing the story. I said, “Well that’s a fun idea, maybe later” and jotted everything down, and put it aside, and the next day I talked with the puppy and worked out the kinked section of my current story, and kept on writing. Of course, I have a binder full of story ideas that are waiting to be written, so we’ll see how that goes. But the important part is that if you keep getting distracted by the next pretty story, you’ll have a bunch of unfinished ones littered around you that the world will never see. Keep on task! 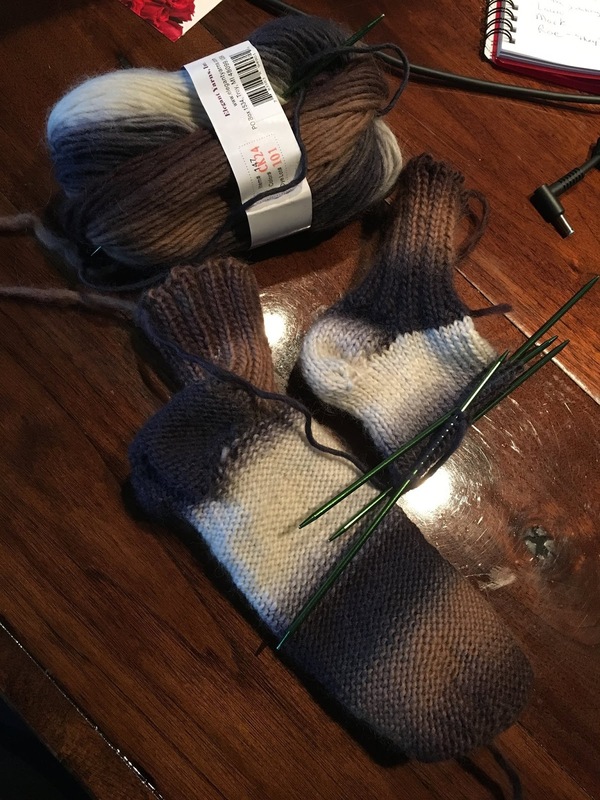 That’s the only way to submit to a publisher, finish a knitting project….or complete anything in life, I suppose. I mean, I hope we did. Hopefully we also hit our word count (or got to where we wanted to be). I wrote 50,075 words, and aside from a few days where I fell behind, I kept up the pace of 1,667 words a day. It taught me a few things, or maybe it reminded me of them. 1. I can write that much in a month. It’s not easy and I couldn’t do 50K every month (without dropping other things in my life) but it’s not impossible. So maybe I need to aim a little higher with my word counts (especially during the winter). 2. There’s more to writing than making words. Yes, I hit the word counts and finished the story, but is the story good? I’m not a strong judge of my own stories, so I can’t say, especially right now, so soon after finishing it. But it does make me want to write a bunch of short pieces (5K-ish) and use them to hone my writing skills (through feedback from my writing group). Then maybe compile them into a book and self-pub them? I dunno, just a thought. 3. I really don’t mind writing vampires. I wouldn’t do it all the time, but it wasn’t a bad experience. I liked being able to fiddle with the myth and add my own twist to things. 4. There is freedom in just writing and not judging. I tried really hard (and think I succeeded) in writing without thinking “Is this any good?” It let me tell the story. Now that it’s done, I guess I can go back and fix things. HOWEVER, as noted above, I do want to improve my craft so that the first draft is stronger and requires less line-level edits (phrasing, structure, language use). That’s all. Hopefully this exercise will mean good things for my future writing! I’ve been in a bit of a funk lately, and, despite what media would have you believe, depression doesn’t actually cause you to be creative in artist outlets. So I haven’t really been doing too much writing (although I have gotten a few thousand words here and there). When I’m in this mood, I don’t usually do much reading either, and I rely on my safe movies and shows. And my safest show of all? 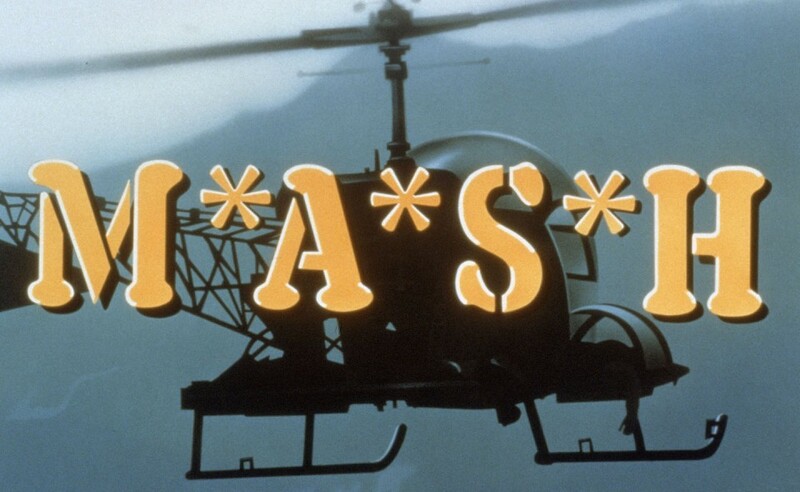 M*A*S*H. Yep, it came out before I was born, but I love it. And yes, I realize it has flaws (what doesn’t? ), but for a long while it was the longest-running show, and while others may disagree, it ended just as strongly as it started. But the trick is, it ended DIFFERENTLY than it started. It began as a goofy comedy just in for the laughs, but the humor matured as the series did, and it became more than humor, often taking on serious, heavy topics. Of course, some people might not like the changes it went through. They wanted comedy, not deep questioning of morality that strove to build character. But I think the series ended stronger than it started, although I agree it couldn’t have continued in such a manner forever. I think it worked best that it started light and corny and grew into it’s own shoes. Plus it offers a variety of entertainment based on your mood. Want eye-rolling jokes? Go for season one. Want heart-jerking depth? Season eleven. Want tender warmth (and often tears)? Hit up any of the Christmas episodes. The trick is that they changed, over time, from episode to episode sometimes, and used a variety of tricks and tools to keep things fresh (for the most part). Yes, there are times where the hospital chatter gets boring, but the stories that are woven throughout are worth it. Just to give you an idea of how much M*A*S*H sits in my heart: I rewatched the entire series over the past few months. It’s a fantastic way to turn off my brain, especially when I’m stressed. And yes, I could have been writing. But relaxing then will hopefully help me be rejuvenated for the future! I just finished The Model Millionaire, an anthology of Oscar Wilde short stories (and named after the story with the same name). In the back, there was also a modern short story, “Tiger, Tiger” by Simon Van Booy. It’s interesting to look at Wilde’s short stories and compare them to “Tiger, Tiger” and some other modern stories that I’ve read recently (including those submitted in my writers’ group). Wilde’s stories tended to be rather straightforward. They told a story chronologically, made a point, and moved on. While the stories didn’t lack subtlety (and I’m sure someone who has studied Wilde in depth would point out how much subtlety there is), I would finish reading a story, be able to quickly draw my conclusions, and move on. I’m certain if I go back and read it again, I’ll pull more from it, but I basically feel as if I “got the gist” in my first read. However, the more modern stories I’ve read (which tend to be read as more “literary”, which may be why they come across like this), seem to be asking the reader to do all the work. Some are told chronologically, some skip all over the place, and they both tell stories, but the telling (both in the information that is provided and the information that is almost obviously not included) seems to beg the reader to understand and get the author’s point. The stories feel like they’re nothing but subtleties. A little bit like if I don’t get the point (or take the time to get the point), the authors are going to peer down at me from their place on high and think me unworthy. I’m probably reading too much into it, but it’s not really the feeling I want when I finish reading something. I’m not sure I could say whether I enjoyed Wilde’s stories or the more modern ones better, but it’s a curious comparison. But how many short stories do you find outside of literary ones? If you’re a reader of short stories, then you know which magazines to read, and you subscribe and you get those short stories–whether it’s literary or in your genre. Or you pick up “This Year’s Best Short Stories” and read that. But rarely–unless you have a group of friends who read short stories–is someone just going to recommend a short story to you. But someone will recommend a good book they’ve read. People don’t really read short stories, and I think part of this is because they aren’t just for enjoyment. And while books also may not just be for enjoyment, their agenda is wrapped in so much enjoyable story that the agenda doesn’t feel heavy to bear and compact to tear apart. Or perhaps it does, but you can enjoy the story without tearing apart and understanding all the agenda. Meanwhile, after reading the various short stories that I’ve read, I don’t feel like I’ve been told stories so much, as I’ve been asked to ponder some things (some of which I might not really care about exploring). The brunt force of the short story’s purpose is the agenda, so the surface enjoyment is so much less that I can see why the short story has fallen out of favor with society as a whole. In a busy world like today, you would think that the short story would be in favor, but if the story is focused not on a compact telling of a story/scene/etc but rather a pondering about X topic…then it’s not really going to be seen as an enjoyable past-time. What’s in a Word Count? The other day I came across a manuscript that was 190,000 words. My mind boggled. That was so long! Most modern manuscripts I see are at max 125,000. But that got me pondering word counts. Is 190K that big? In it, I learned that Gone with the Wind is over 400K. Wow. So maybe 190K isn’t that big. After all, there are several well-known books on that list that are the same length. Of course, a few things are different since Gone with the Wind was published in 1936. Television and internet create a world where we either need to keep your attention or lose it to something more immediately entertaining. Not that people can’t/won’t sit down and read 400K, but it’s harder to entice them in and get them to read through it. I understand completely, as finding time to keep up with all the entertainment and media stuff is hard enough. Who has the time to read something that long. Is it fair to a book that is 200K and a masterpiece that it may never be purchased by a publisher because it’s just not marketable (assuming it can’t be broken into two smaller books that may be more enticing)? Maybe not, but that’s the world we live in. In general it seems fairly accurate, though I think with more progression in the digital age, some of the lower word counts can be moved down. For instance, 75K seems to be a golden number in the books I see. Not too short, not too long. Enough space to flesh out the character and story, but not enough to lose the reader to a billion other things. My point (yes, I have a point!) is that when we’re writing, we need to keep in mind our genre, audience, etc. Yes, we should write for us, but if we want to be published, keeping in mind these guidelines (not rules or laws, just guidelines) are important. Cheating on some points within a genre may make books harder to sell (but not impossible) to a publisher. Cheating on all of them means a book better blow them out of the water for them to take the (likely) risks. And this isn’t meant to be preaching or teaching so much as just a reminder to myself. Or maybe just an awareness to keep in the back of my mind. You know, along with all the other crazy stuff. While reading one of my blogs, he posted this, which, as a person who loves to go barefoot. I found interesting. He also mentioned these shoes, which I’d love to try one day. The above philosophy is fine, and might appeal to some, but what you want is a practical guide, no? I’m not going to give it to you. There isn’t a one-size-fits-all solution, nor is it desirable to live the life prescribed by someone else. The whole point is to do it on your own, without buying one of my books or doing it exactly as I do. Live this philosophy, in small bits, and see if you like it. It takes some time to adjust to this approach, but it’s lovely in the end. Try walking barefoot (tips , faq ). Get rid of a couple boxes of clutter today. When you leave your house, take less with you than usual. When you find yourself worried about the future or past, breathe, and focus on your breath going in and out. When you find yourself wanting to buy something, pause. Then think of how you can live without buying it. Take time to fully enjoy a few simple pleasures today: the slow savoring of a small portion of something delicious, watching nature, spending time with a loved one, walking. Think of the restrictions you impose on yourself, and see if you can lift a few of them. Most of all, be present and enjoy life. Whether you follow this or not is up to you. Just something to think about as we approach the new year. Ever have one of those days where you come across readings that just speak to you? For work I had to read an article about atrial fibrillation, a condition from which I mildly suffer (at least, I hope mildly. My understanding of the condition was limited to me being taught about it as a child). We always just called it heart palpitations, but really it’s Afib and reading about it in the article was depressing (symptoms, side effects, mortality rates). I had the impression that I should value my life and live it to the fullest. Do what I want in case my hours are marked. Driving home I considered (not for the first time) that maybe I’ve never really pondered the future, that I’ve never been able to envision the future because I don’t really have a future. That sounds so morbid…But sit and listen to your heart beating quietly in your chest. Think about how fragile it is. Think about how with a single seize it could fail and then you’d be no more. So I want to take better care of myself. I can’t give up caffeine completely (and I’m not sure how much influence it has anyway) but I would like to cut back. And try to do more relaxation/meditation. That’s it for now. We’ll see how it goes. Tonight I finished The Lost Language of Cranes by David Leavitt. In it, after Philip’s boyfriend has dumped him, he realizes he has alot of free time on his hands and if it weren’t for work and his parents, he could just vanish into nothingness. This spoke to me, because I often wonder if I could just vanish. And then I got to wondering if I do all these things to fill my time so that I don’t realize how easy it would be to vanish.